Dumbass was born sometime in 1994 in Vancouver Canada. For over a decade they have been engaged in an ongoing process of ceaseless artistic experimentation. Their expressionist works and performances have challenged and continue to challenge both their audience and the artists themselves. An, as of yet unnamed band begun by Zeke Mason (songwriting, vocals & guitar) and a friend (percussion on paint cans and buckets). They begin to make experimental recordings with a tape recorder. A second guitarist and a real drummer join. The second founding member leaves. The new format (2 guitars, vocals and drums) now resembles a real band and the band finds a name. Dumbass begin performing live and continue writing songs. Members come and go. In the spring Dumbass begin recording their first real album (Hell) with a 4 track tape recorder. In response to the departure of their drummer just before the recording process begins, Zeke Mason learns to play the drums for the studio recording. The album is released on home-copied cassettes. At the end of the year Dumbass begin work on their second album in a real recording studio. In the spring Dumbass release their second album (Salvation), this time on compact disc. In the fall they begin work on their third album (Hate Beyond Hope), the culmination of which coincides with the break-up of this third incarnation of the band. Zeke Mason begins working on some new songs that will eventually make it onto the Misery double album. Dumbass now exists as a studio project alone. For a two year period Zeke Mason works on a new double album. There are no live performances during this period. On December 21, 2000 the album (Misery) is released. year anniversary of their first live performance with an epic invite-only performance. Zeke Mason begins his first collaborations with Fixer who slowly moves from being merely a live performer of Zeke’s material to a writing partner. Zeke and Fixer record the next Dumbass album (The Execution of Certain Actions) in scrap yards, railway tunnels and the studio. After the anniversary performance the live band looses its keyboard player and now consists of just Zeke and Fixer (the live band and the studio band become the same duo). This year sees the release of several projects including a new studio album (Hymns of Disillusion), an album that consists of a single 61 minute long song (Stories), and the first week of a project that is to be written and recorded in 2 weeks, one in the middle of summer, the other in the dead of winter (Summer/Winter/2 Weeks) and a 2 disc best of collection (The Best of 1995-2002). In the fall Zeke travels to Europe and gets the idea for a new album in Berlin. From October 2002 (working on the theoretical premise in Berlin) to November 2003 Zeke and Fixer work on the new album (Die Mauer). The album’s songs are based on site recordings that the band make while traveling around the wilderness of British Columbia in a 4X4. The instruments are bridges, power towers, a disused ferry dock, trees, rivers, rocks and assorted found objects. The band then take these recordings into the studio and add guitars, piano, vocals and other instruments. After the monumental Die Mauer album Dumbass decide to move in another direction for their next project. Their next album (The Me Generation) is an album of industrial-rock songs that explore themes of commercialization and socialization in the most advertised to and catered to generation yet. The album, true to its theme is released completely free both in hard-copy and as an internet download. Zeke and Fixer also assemble and release 2 albums of collected mood-piece songs from the years 1995-2004 (Lumina and Lumina 2). Random Actions) and further continuations begin to follow. 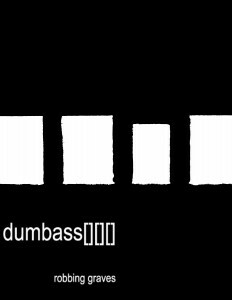 Dumbass begin work on a new heavy industrial-rock style project that further develop themes from The Me Generation. Dumbass release a series of free singles for download from their website. They continue to work on the Modernity album as well as several other projects. Dumbass also begin releasing videos and producing DVDs. Dumbass release the 10 song Dumbass Sampler online and in hard copy. The sampler is a collection of 10 of the more accessible tracks from the past 6 years and is meant to be a general introduction to the band for the uninitiated. Fall 2007 sees the release of Modernity – an industrial-rock flavoured distopic look at the world around us – as well as the launch of a new and improved Dumbass website and work in many more areas. This year sees the release of The History of Idiocy (The Best of 2002-2008), a two disc collection spanning an incredibly fertile period in the band’s history. This collection contains not only the best Dumbass songs of this period, but some of the best Dumbass songs ever created. The band also work on a new album that will see release the following year. Dumbass release God’s Garden – an organic and experimental album that feels like a logical development from the movements of the previous several years of work, which sees the addition of Stanley Pushkin. The band also begin the early stages of work on a new album, as of yet untitled. Further atrocities are planned.